The grass is cut. The dirt is raked. The smells of stadium food are in the air. The sounds of beer vendors so eloquently pierce our ears. It’s that time of year; the best time of year. It’s time for Baseball. And when Mariano Rivera walked out of the dugout to throw the first pitch to start the season, it gave you all the feels. Welcome to the 2019 Major League Baseball season. The season where the New York Yankees are destined for greatness, because after only one game, overreact we must. With Cashman’s work in the off season acquiring Paxton and a full season of Happ, the Yankees are poised to move the pitching needle from decent to great, and Tanaka was poised to have a better Opening Day performance than his previous three. Given that his other Opening Day starts gave him a combined ERA of over 9, I’d say this good enough performance was exactly what the Yankees were looking for. The Fourth Time is Tanaka Time, I guess. And the offense? Well, they picked up right where they left off. Luke Voit continued to show that mashing tires helps you mash home runs, and judging by the reaction of the crowd, he’s quickly become one of the most beloved Yankees on the team. Unless Bird has a Hall of Fame start to his season, something tells me Voit isn’t going anywhere — I think the Yankee brass loves Voit even more than the fans do. He’s Cashman’s prized analytic possession, and Chasen Shreve is, well, Chasen Shreve. We had balls hit north of 115-mph by Judge and Stanton, Tulowitzki’s first hit since July 2017, and an Ottavino debut we’re still fanning ourselves over because three of the four batters he faced did exactly that: fanned. When Chapman shut the door on the lowly Orioles, it opened our hearts to endless possibilities. All in all, it was a good day in the Bronx. 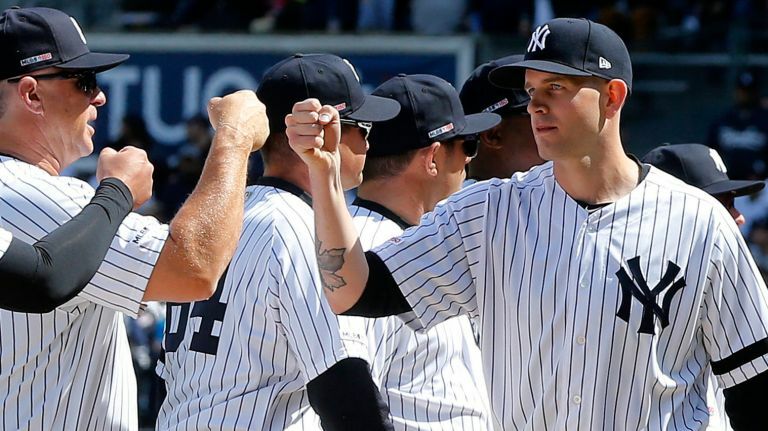 All in all, it should be a good year in the Bronx, with Paxton set to make his debut this afternoon, the Yankees are set to embark on the first ever undefeated season in the history of the game. They need to stay on the field. CC and Sevy are already on the shelf, but seemingly will be back with not much concern. Once they’re back, health is the number one priority, and Severino needs his first-half mojo to last all year long. He is the ace, and we don’t win without him. Gary Sanchez needs to be the comeback player of the year. Enough said. Offense wins games. Defense wins championships. The defense last year was one of the worst in the league. It seems so minor, but it really is a big deal. Improving the D will improve the Yankees chances in winning that ring. It’s important, and if you don’t think so, then ask Cashman why he acquired gold glove caliber infielders, DJ LeMahieu and Troy Tulowitzki and why Andujar didn’t win Rookie of the Year last year. Defense matters, ya’ll. If there was a fourth, it’s overall health. It’s always health. Judge, Stanton, all the core guys need to stay on the field. If they do, in the words of Aaron Judge, they will “crush the home run record,” but most importantly, they will win the World Series. Game 1 of 162 is in the books, and if my calculations are correct, the Yankees are on pace for a 162 win season, while the rest of the division are heading for winless ones. However, as the great John Sterling would say, “You can’t predict Baseball, Suzyn.” No, John, we can’t. But we can dream. And wait, there is a fifth one… crush the Orioles. Please.